These white rhinos have been reintrodused in Botswana, Namibia, Swaziland, Zimbabwe, Kenya, Zambia and Cote d'Ivoire. Recently a calf was born even in Uganda but the hunt for horns is problematic. 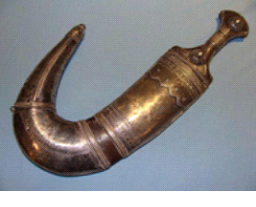 The coveted horns are used in Chinese and Vietnamese medicine and to handle daggers in Oman and Yemen. The use of daggers has been reduced but the use in Chinese medicine seem to increase. 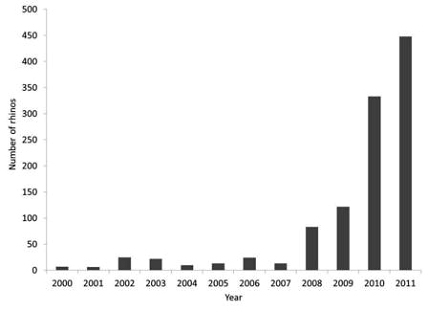 Below is a diagram of rhinos killed in South Africa. South Africa has about 95% of all African rhinos. Lately they have started introducing them in the Okavango Delta which have very good control over some areas. At one time, these rhinos were prevalent in the area.